Why are all those people drinking coffee and eating donuts on the bike path? The scene this morning on the Esplanade at the Steel Bridge. 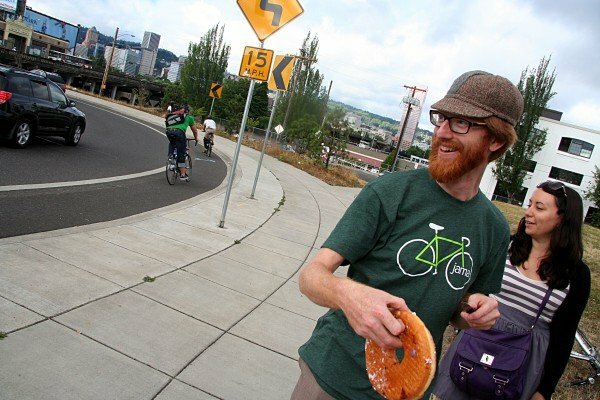 If you’re new to biking in Portland you might notice something afoot on the last Friday of every month as you pedal into downtown: A bunch of happy-looking people standing around with coffee and donuts in their hands. Next time you see this, consider stopping: It’s for you! 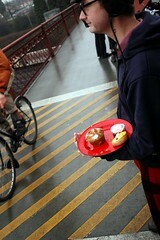 What you’re seeing is an old Portland tradition known as Breakfast on the Bridges. For the past 14 years (14!) a hardy bunch of volunteers affiliated with Shift have been serving food and drinks and smiles on downtown bridges from 7:00 to 9:00 am. It currently happens on the Hawthorne (west end), Steel (east end), and the Tillikum (east end). The selection of eats varies from month-to-month. I’ve seen everything from bagels and bacon to made-to-order pancakes. This morning on the Tillikum Lilian Karabaic and friends offered chocolate peanut butter oatmeal cookies and banana muffins. If you’re wary of stopping because you think you’ll have to sign up for something or listen to someone’s political or product pitch, don’t worry. “B on B” (as the locals call it) has no agenda (although politicians have been known to show up). Like everything Shift makes happen (Pedalpalooza and the World Naked Bike Ride included), the goal is simply to have fun and meet people. Friday news bits: Promotion, police, parking, and… eggs benedict?! 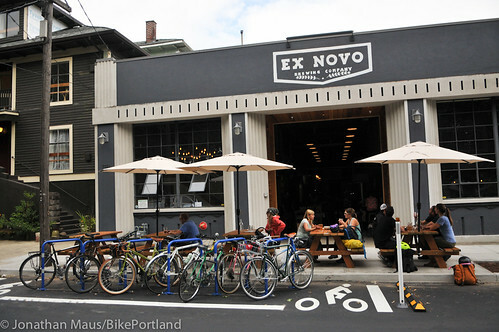 Just opened Ex Novo Brewing on N Flint already needs more bike parking. I’ve got several small bits of local news I wasn’t quite sure what to do with, so I figured I’d round them all up here on the Front Page. Lance and Becky Poehler attempt to find takers for a very large Voodoo Doughnut. 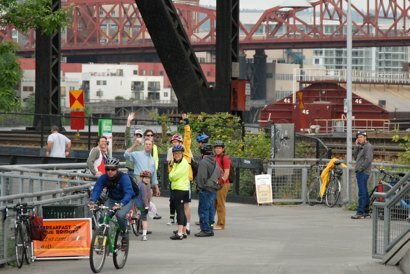 The Burnside Bridge often goes unsung and unappreciated by bikers: Blame the slightly hairy merge with turning traffic on its west landing, or the awkward approach from the east. But as of today, the Burnside won’t be going unfed. the crowd on the Hawthorne Bridge this morning. 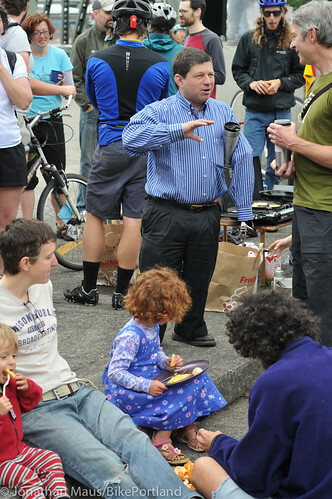 City of Portland Transportation Commissioner Steve Novick showed once again this morning that he’s a hands-on leader. In the past few months (even before Mayor Hales gave him the PBOT portfolio), Novick has shown up to support walking, biking, and transit. 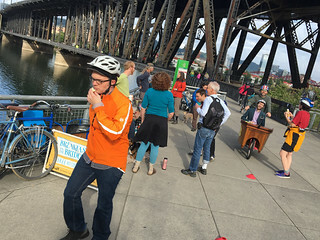 This morning he and his policy director Katie Shriver walked a few blocks from their City Hall offices to the west end of the Hawthorne Bridge where volunteers with Shift were holding their monthly Breakfast on the Bridges event. 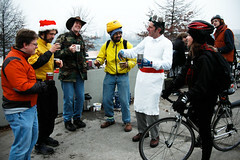 Breakfast on the Bridges is a proud Shift tradition that started years ago as a way to create community and offer a friendly smile and free coffee and munchies for people riding bikes. Fruit, coffee and other foods are donated by local stores and volunteers wake up early to brew fresh coffee to serve to anyone who rides by. The event happens on both the Hawthorne and Steel Bridges. you free breakfast next week. TriMet, in partnership with bike fun promoting non-profit Shift, will host three Breakfast on the Bridges events at the end of this month. Santa Lucia surrounded by admirers. The friendly and fun Breakfast on the Bridge crew on the Esplanade this morning. Breakfast on the Bridges hits the East Coast! 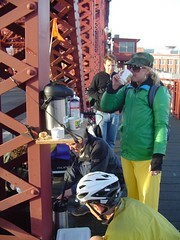 Breakfast on the Bridges is the quintessential Shift to Bikes event. It is organized 100% by volunteers and funded with coffee and pastries that are donated by local businesses. It has no agenda other than to make people smile, thank them for riding their bike, and encourage a fun, festive, bikey atmosphere. A few months ago a national magazine covered it, and now comes word that Transportation Alternatives – a transportation advocacy group in New York City – has started their own version. 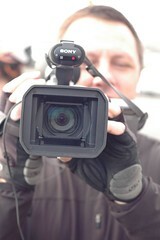 I love it when Clarence Eckerson of BikeTV comes to town. 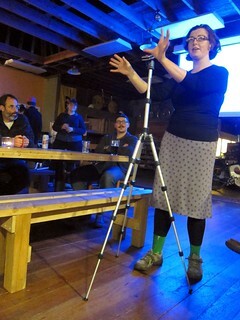 The NYC resident, whose heart belongs to Portland bike fun, showed up at Breakfast on the Bridges last Friday and put together this fun and inspiring movie. It features interviews with volunteers and bike commuters who stopped for the free pastries and coffee. Far beyond just documenting bike fun, Clarence does amazing work with his camera. 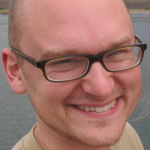 He is the videographer for The Open Planning Project, a NYC-based non-profit with a mission to “build technology to enhance the role of the citizen in democratic society.” He’s currently in Portland researching an upcoming production about the history of the Mt. Hood Freeway.